French & American Cabaret with a Twist of Jazz. The French have a word for this young, professional Cabaret Jazz singer and performer. Extraordinaire! Her repertoire ranges from her specialty - soulful and haunting renditions of cabaret songs à la Edith Piaf to other popular French tunes (Chevalier, Montant, Trenet, Mistinguette, Becaud, Aznavour), and lively performances of Broadway and Jazz favorites. Invariably, listeners of all ages respond with enthusiasm to her invitation for "request songs" in French and English. 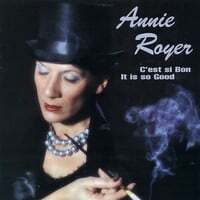 Annie Royer's charismatic style is suited to and engages both, small and large audiences. She is a sought-after entertainer at Jazz Clubs, Concert Stages, Festivals, Private Parties and Corporate Functions. She is performing all over the Country. Her band "The Garçons Musettes," all very talented and well known musicians, backs her.